Black Dome is the second highest point on the west end of the Tank Mountains, located in the northwestern Sonoran Desert in northeastern Yuma County, Arizona and 57 miles (92 km) east northeast of the city of Yuma.The western two thirds of the Tank Mountains, including Black Dome, are located in the Kofa National Wildlife Refuge which is managed by the U.S. Fish and Wildlife Service. The east-west trending Tank Mountains lie next to the Kofa Mountains to the northwest. The Black Hills of Greenlee County are a 20 mi (32 km) long mountain range of the extreme northeast Sonoran Desert bordering the south of the White Mountains of eastern Arizona's transition zone. The mountain range is bordered by the Gila River, and the range is a large block that forces the Gila to flow northwest, west, southwest; at the west, the Gila River begins an excursion northwest at the start of the Gila Valley, where Safford and Thatcher lie in the valley. The southwest quarter of the mountain range lies in the southeast of Graham County. The Cabeza Prieta Mountains are a mountain range in the northwestern Sonoran Desert of southwest Arizona. It is located in southern Yuma County, Arizona. The mountain range is amongst an eleven-mountain sequence of north-trending ranges and valleys in the hottest region of the Sonoran Desert. This southwestern Arizona region is on the northern perimeter of the Gran Desierto de Altar. It includes the northern part of the Pinacate volcanic field. The Cabeza Prieta Mountains extend northwest–southeast about 24 miles. The highest peak is unnamed at 2,832 feet (863 m); other peaks include: Cabeza Prieta Peak at 2,559 feet (780 m); Buck Peak-(in north) at 2,629 feet (801 m); and Sierra Arida in the south, at 1,736 feet (529 m). A separate mountain outlier lies southwesterly, Tordillo Mountain at 2,170 feet (661 m), adjacent to a primitive road paralleling the US-Mexico Border, called El Camino del Diablo. The range is about 36 miles southeast of the Mohawk Valley (Arizona), and Interstate 8 and is in the west-central Barry M. Goldwater Air Force Range. The Cabeza Prieta Mountains comprise the entire western region of the Cabeza Prieta National Wildlife Refuge -- about twenty percent of its total area. 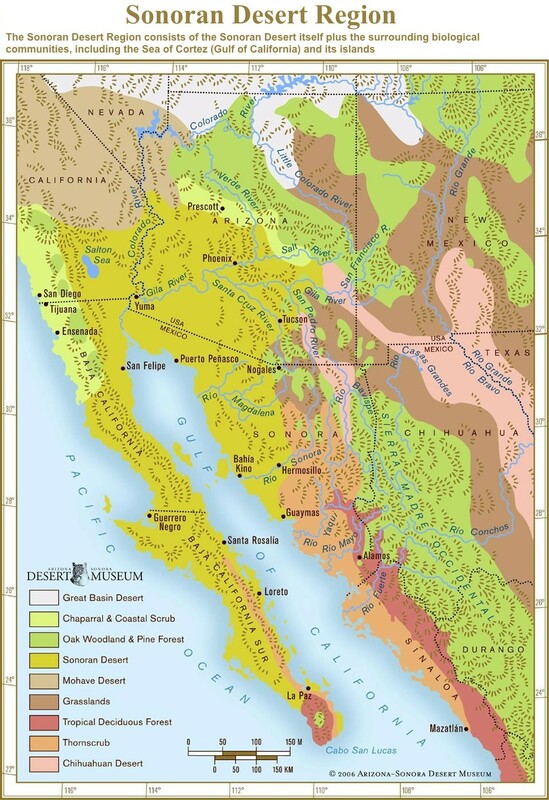 California's Colorado Desert is a part of the larger Sonoran Desert. It encompasses approximately 7 million acres (28,000 km2), including the heavily irrigated Coachella and Imperial valleys. It is home to many unique flora and fauna. The Colorado River toad (Incilius alvarius), also known as the Sonoran Desert toad, is found in northern Mexico and the southwestern United States. Its toxin, as an exudate of glands within the skin, contains 5-MeO-DMT and bufotenin. Cowlic is a census-designated place (CDP) in Pima County, Arizona, in the United States. The Growler Mountains is a 23-mile, (37-km) long north-south trending mountain range of far western Pima County, Arizona that lies 12 miles (19 km) west of Ajo, Arizona. This desert region of southern Arizona lies in the north and central Sonoran Desert, and is one of the drier desert areas of North America. The highest peak of the Granite Mountains is Unnamed at 3,294 feet (1,004 m) and is located in the south; Growler Peak is located at the north end of the range at 3,029 feet (923 m).The Growler Range has the distinction of being on a water divide between two northwest-draining washes to the Gila River. The Growler's are at the headwaters of Growler Valley west of the range which is the southeast drainage to the San Cristobal Wash. The north end of the range is south and southwest of Childs Valley which is part of the Tenmile Wash Drainage. The two drainages are at the beginning of the Gila River's turn from going south-to-west and exiting southwest Arizona with its confluence with the Colorado River at Yuma, Arizona-Winterhaven, California. The Lechuguilla Desert is a small desert located in southwestern Arizona near the U.S.-Mexico border. It is considered to be part of the Lower Colorado Valley region of the Sonoran Desert. It lies in a north-south direction between the Gila Mountains and the Cabeza Prieta Mountains, and almost entirely in the Barry M. Goldwater Air Force Range. The desert is named after the Lechuguilla plant, known scientifically as Agave lecheguilla which according to the Wikipedia entry for that occurs exclusively in the Chihuahuan desert many hundreds of miles to the east. The desert is also on the north border of the Gran Desierto de Altar of Sonora, Mexico. The Lechuguilla Desert lies to the east-northeast of the connected ranges, Gila Mountains, and north of the Tinajas Altas Mountains, which extend southeast into north Sonora. To the west and southwest of the two ranges lies the Yuma Desert. The Tule Desert (Arizona) lies east of the Lechuguilla, and the Cabeza Prieta Mountains; all three deserts are at the northwest perimeter of the great desert, the Gran Desierto de Altar, and the Pinacate Peaks volcanic field region. This list of birds of the Sonoran Desert includes all bird species endemic to the Sonoran Desert, and related areas; (a few species listed are only "native" and have a larger continental range). They are retrieved from the List of birds of Yuma County, Arizona, though not exclusively. The Lower Colorado River Valley ("LCRV") is the river region of the lower Colorado River of the southwestern United States in North America that rises in the Rocky Mountains and has its outlet at the Colorado River Delta in the northern Gulf of California in northwestern Mexico, between the states of Baja California and Sonora. This north–south stretch of the Colorado River forms the border between the U.S. states of California/Arizona and Nevada/Arizona, and between the Mexican states of Baja California/Sonora. It is commonly defined as the region from below Hoover Dam and Lake Mead to its outlet at the northern Gulf of California (Sea of Cortez); it includes the Colorado River proper, canyons, the valley, mountain ranges with wilderness areas, and the floodplain and associated riparian environments. It is home to recreation activities from the river, the lakes created by dams, agriculture, and the home of various cities, communities, and towns along the river, or associated with the valley region. Five Indian reservations are located in the LCRV: the Chemehuevi, Fort Mojave and Colorado River Indian Reservations; at Yuma are the Quechan and Cocopah reservations. The Quinlan Mountains is a mountain range in the U.S. state of Arizona. Its highest point is Kitt Peak at 6,883 feet (2,098 m), which is also the second-highest peak on the Tohono O'odham Indian Reservation, after Baboquivari Peak. The range lies on the eastern end of the reservation about 55 miles (89 km) southwest of Tucson.The Quinlan Mountains are north of the Baboquivari Mountains, the two ranges separated by the pass at the head of the Pavo Kug Wash. The Quinlan range also sits southwest of the Coyote Mountains, separated from them by the Pan Tak Pass. When George J. Roskruge created the official map of Pima County in 1893, he named the range after James Quinlin, who had opened a stagecoach station in the nearby town of Quinlin in 1884. Although the range had also been known as the Quinlin or Quinuin mountains at different points in history, Quinlan became the official name as a result of a decision by the Board on Geographic Names on April 16, 1941. Rillito is a census-designated place (CDP) as well as a populated place in Pima County, Arizona, United States, completely surrounded by the town of Marana. The largest business in the community is Arizona Portland Cement and the community has had a post office since the 1920s. There is a regional park and recreation center (Rillito Vista Community Center) in the middle of the community. Rillito has the ZIP Code of 85654; in 2000, the population of the 85654 ZCTA was 148. Sonoran Desert National Monument is south of Goodyear and Buckeye and east of Gila Bend, Arizona. Created by Presidential proclamation on January 17, 2001, the 496,400 acres (200,886 ha) monument is managed by the U.S. Bureau of Land Management as part of the National Landscape Conservation System. The BLM already managed the lands, however under monument status, the level of protection and preservation of resources is enhanced. Sonoran Desert National Monument protects but a small portion of the Sonoran Desert, which is 120,000 square miles (311,000 km2), and extends well into California and the country of Mexico. The North Maricopa Mountains, South Maricopa Mountains and the Table Top Wildernesses protect the richest regions of desert habitat from development. The 300 MW Sonoran Solar Project is a proposed solar energy project in the Sonoran Desert, within Maricopa County, Arizona. It is a photovoltaic solar power plant, planned by a subsidiary of NextEra Energy Resources. Secretary of the Interior Ken Salazar of the Obama administration granted approval for the project in December 2011. It would be the first solar project in Arizona to be built on federally owned land. The Tule Desert is a small desert located in southwestern Arizona near the U.S.-Mexico border. It is considered to be part of the Lower Colorado Valley region of the Sonoran Desert. It lies in a north-south direction to the east of the Cabeza Prieta Mountains and almost entirely in the Barry M. Goldwater Air Force Range. The Tule Desert also lies on the northern border of the Gran Desierto de Altar of Sonora, Mexico. The West Silver Bell Mountains are a small 10 mile (16 km) long mountain range of south-central Arizona, United States. The range lies in the north-central arid Sonoran Desert; the Madrean Sky Islands region of southeast Arizona, around Tucson is adjacent to the southeast. The range lies 25 mi west of Marana, and 25 mi south of Eloy–Casa Grande, all cities on Interstate 10 in Arizona. Casa Grande also begins the west route of Interstate 8 to Yuma and San Diego. The Yuma Desert is a lower-elevation section of the Sonoran Desert in the southwestern United States and the northwest of Mexico. It lies in the Salton basin. The desert contains areas of sparse vegetation and has notable areas of sand dunes. With an average rainfall less than 8 inches (200 mm) each year, this is among the harshest deserts in North America. Human presence is sparse throughout, the largest city being Yuma, Arizona, on the Colorado River and the border of California.